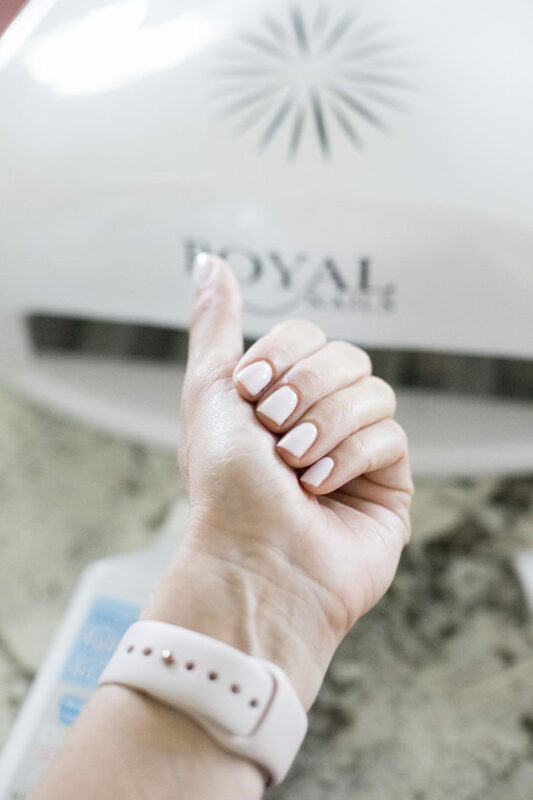 So, there’s a little back story to this gel nails at home tutorial. I bought some of these products almost 3 years ago because I thought I was going to start doing gel nails at home. I tried twice…and wanted to punch a hole in the wall each time. I did not know what I was doing, and even when I followed tutorials, they didn’t work for me! The past year and a half I have gone to the salon at least once a month to get my gel nails done. I have paid a lot of attention to what products they were using, but I still didn’t have the desire to do my nails at home. There were a couple things that bothered me though – 1) Getting my nails done was so time consuming! I had to drive to and from the nail salon (typically 20 minutes each way) and then I was there for an hour, and 2) I couldn’t find anyone that I absolutely loved going to. The last time I went, the man doing my nails was not very nice, to say the least. I accidentally bumped my nail on the nail drier and he looked at me and proceeded to lecture me on why I should hold my hand still, be more careful, and then rolled his eyes at me. Sooooo….that leads me here today! These two factors motivated me to give doing my gel nails at home another shot. I had learned a few things over the years. It’s nice, because now I can sit down and watch a show on TV (who has time for that?! I do now) AND do my nails at home while saving money. It’s a win/win. Oh, and no one rolls their eyes at me. First things first, you will need the supplies to get gel nails at home. 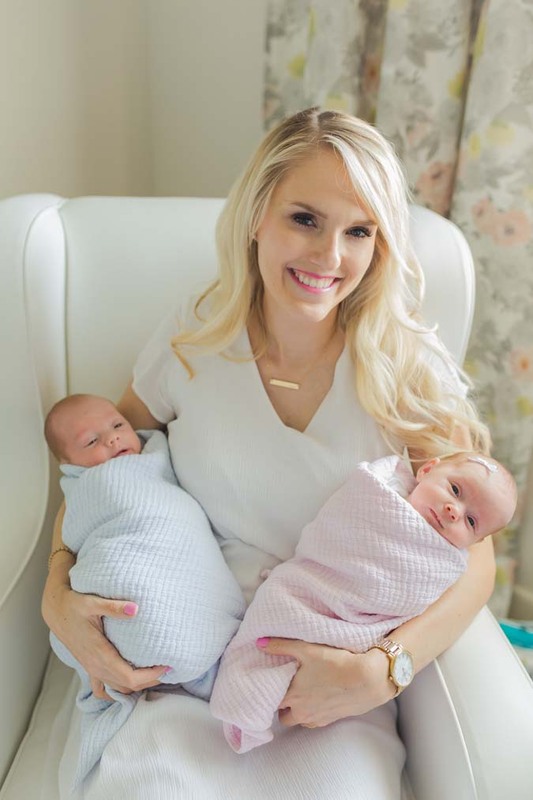 Keep in mind that it’s an initial investment but it will pay off over several times, and then be significantly less expensive then going to the salon each month. The supplies that you buy will either make or break your success, and like I said, I have been watching what to use and I think that a big reason why I got so incredibly frustrated the first few times I did my own gel nails is because I didn’t have the correct supplies for success. Nail lamp. The one that I got a few years ago is no longer for sale, but I did my research and this one is a great option. It has hundreds of great reviews and is about 1/4 the price that I paid for mine. Acetone to remove the polish. This is the kind that I bought that I love (it hadn’t arrived by the time I took these pictures which is why it’s not pictured). 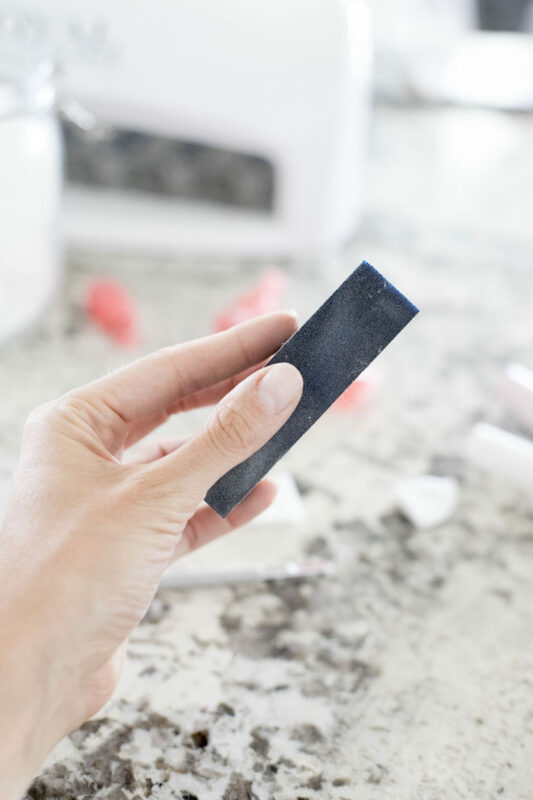 Nail file – I HIGHLY recommend a glass nail file. This one is a great option! Gel nail polish – search here for some favorite colors. I love this color, this color and this color a lot. 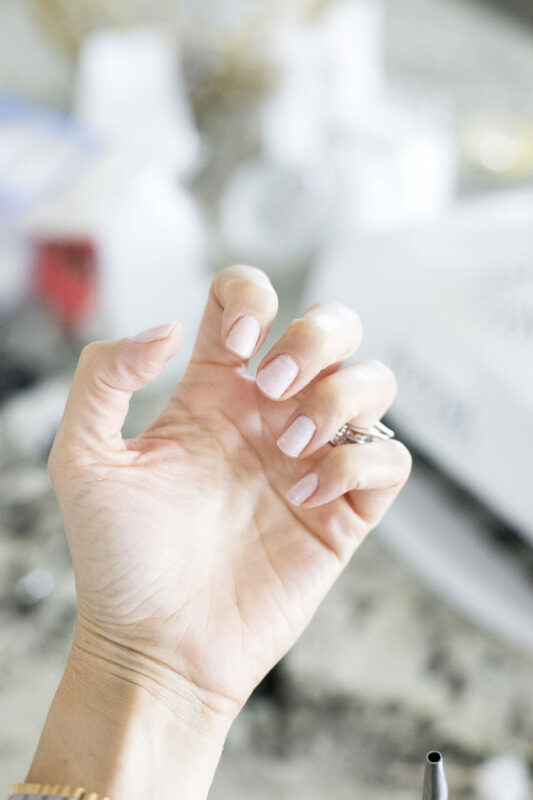 If you have gel polish on already, you need to cut your cotton pads into 4 pieces, and soak each of them with acetone. Buff the top of each nail, then cover your nail with the cotton pad and then apply the nail polish soak off clip to hold it in place. Keep it there for 15 minutes. This is a great time to watch a good show on TV! 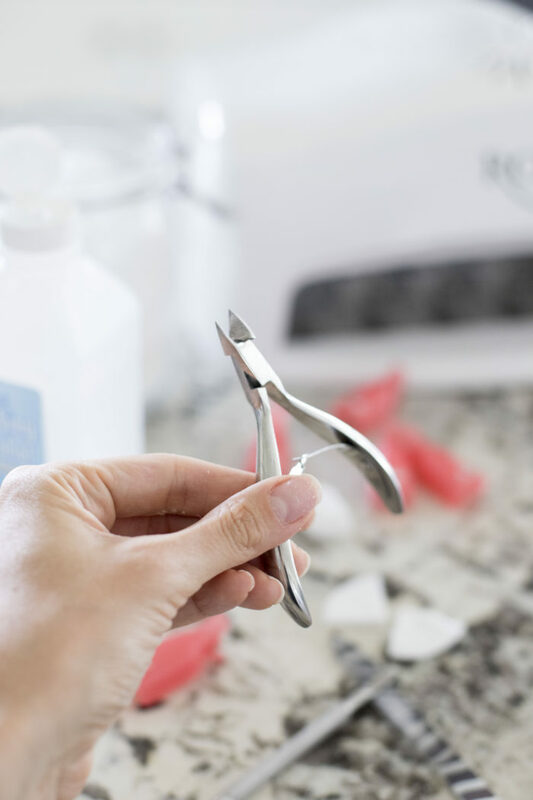 Remove the clips and begin scraping off the gel polish with the steel cuticle remover and scraper. The polish should be lifting up and it shouldn’t be too difficult to remove at this point. If it is, apply another cotton pad with acetone for a bit longer. 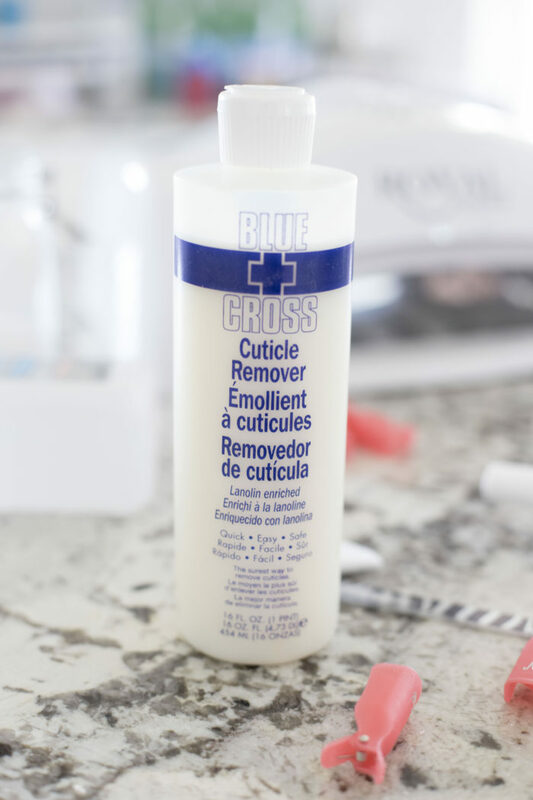 Apply the cuticle remover liquid onto your cuticles and rub in. 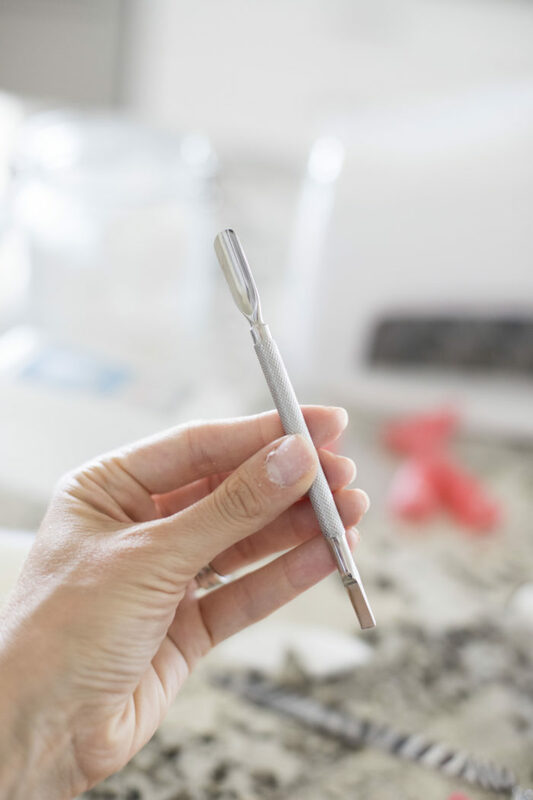 Use the the steel cuticle remover and scraper to push down your cuticles and scrape them off your nail. Use the cuticle clipper to cut off the cuticles from your nail. 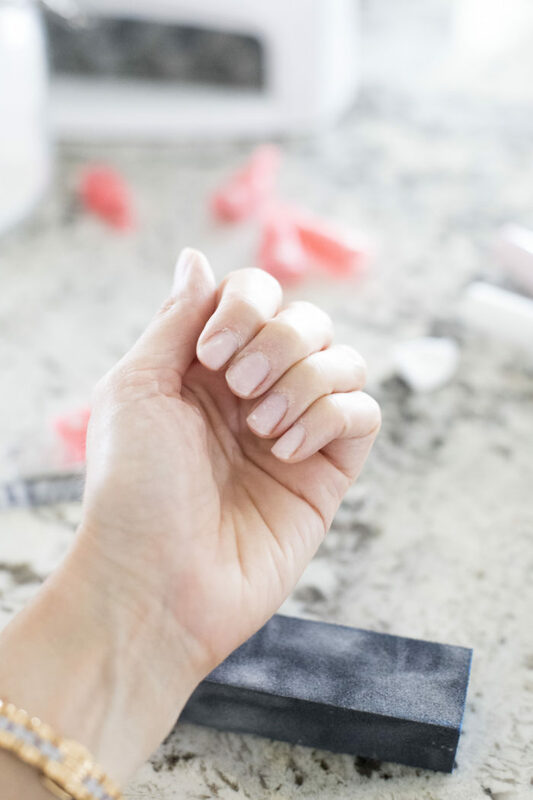 Clip your nails to the length that you want them, use the nail file to shape them, and buff the tops of your nails to take off a bit of the top layer of your nail. This will help the gel polish to adhere to your nails better. Rinse your hands with water (no soap) and remove all of the dead skin and dry well. Make sure the nails are completely clean. Paint on the PH Bond to help dry out of your nails. 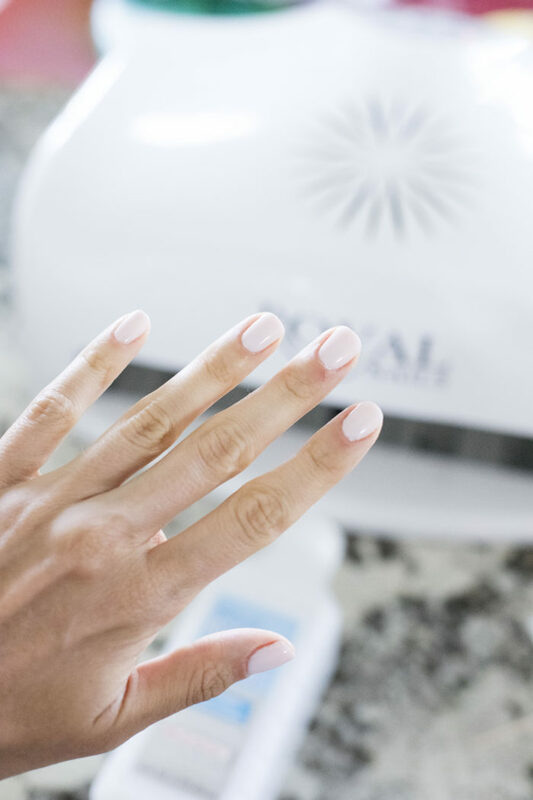 Apply an extremely thin layer of the base coat gel polish onto your nails then cure under the light for 120 seconds. Remember, make the layer as THIN as possible! This was my huge downfall when I wasn’t able to do gel nails at home well. It started to build up into a big mess. Not anymore, sister! I learned my lesson. Apply one coat of gel polish (remember, as thin as you possibly can!) If you get the polish on your skin, use some acetone to wipe it away before putting your hand under the lamp again. I also like to use toothpicks to wipe away small amounts from my cuticles if I happen to get polish there. They key is not get any polish on your cuticles or they will start to peel much, much faster. Let the polish cure under the lamp for 120 seconds, then do another layer and cure for another 120 seconds. Some lighter polish needs a 3rd layer, and if so, do a 3rd layer of polish then cure for 120 seconds. Apply the top coat then cure it under the lamp for 120 seconds. 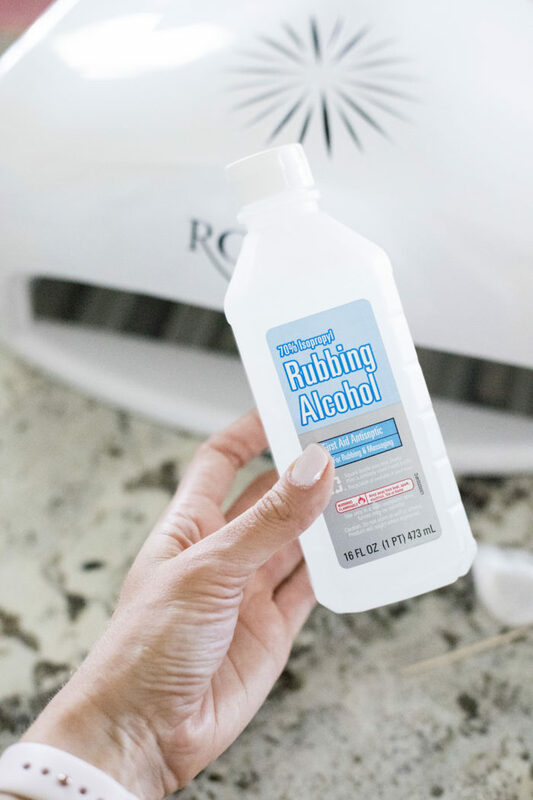 Soak a cotton pad in rubbing alcohol and rub each nail well. You’re done! 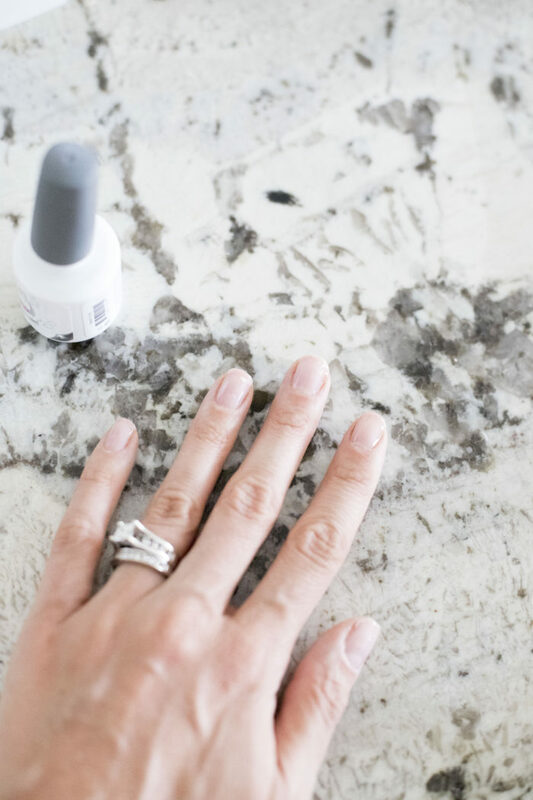 You don’t have to wait for it to dry and you can touch anything without ruining your manicure. This is why I love gel polish!! 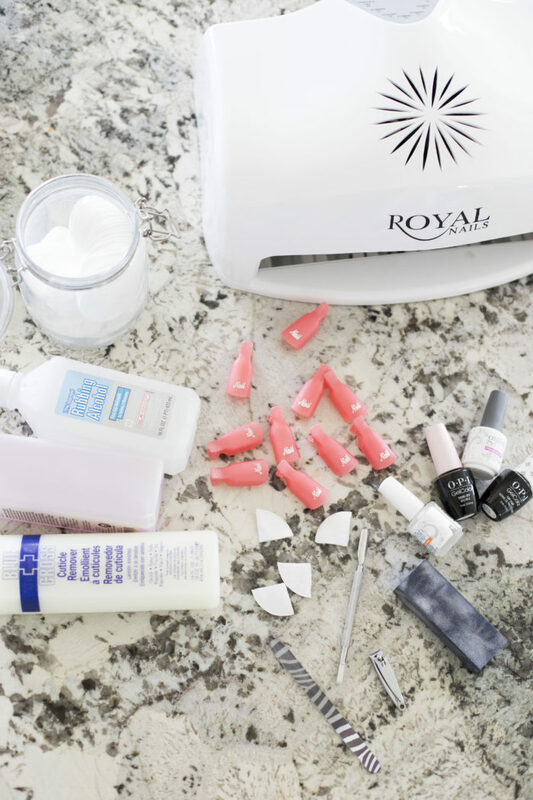 You are not going to be perfect at doing gel nails at home the first time! Practice makes perfect. Be patient and let yourself learn by doing it many times. 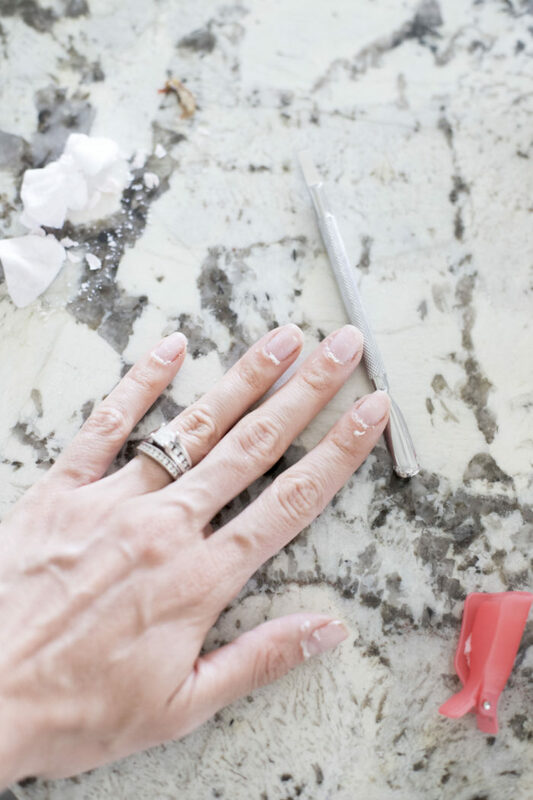 Your nails may peel quickly the first few times because, again, you are not going to be perfect at this right from the start. Remember, I quit and didn’t do it for 3 years because I thought I wasn’t cut out for it! 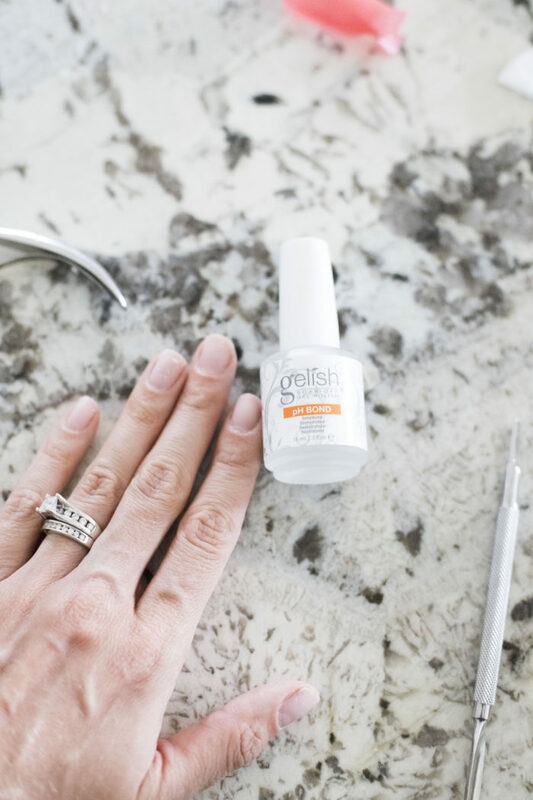 With the tools above and practice, you will be an at home gel nail queen in no time. Love this! They look so good! What color polish did you do in this tutorial? And about how long does the process take from start to finish? Can you apply this to doing gel on your toes too? ???? Love this! I just started doing my own gels a few months ago and it’s always nice to hear how other people do that . I also use OPI funny Bunny which I absolutely love in just put in an order with Madam glam – it’s another gel polish brand that I’ve heard good reviews about – hopefully it’s a winner! 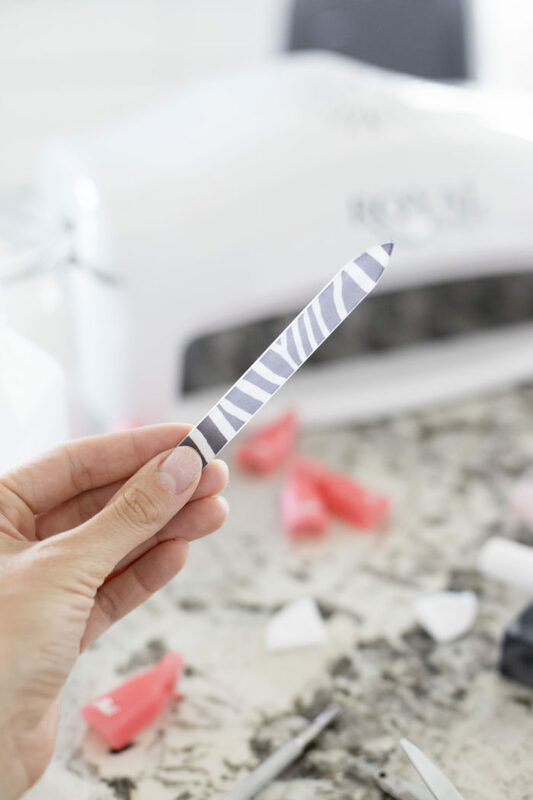 BTW – we are have these nail polish remover clips been my whole life ?!?!? The clips have changed my life! SO much faster and easier than foil! And thank you! I want to try those polishes you recommended! You should! I got a few fall colors and they are great, good price , great coverage and usually only 2 coats! You are so amazing! Thank you for posting this!!! I’ve been waiting to buy things until you posted. ???????????? You are so welcome, I’m so glad this helps!! Thanks for this great article. The lady I go to does a good job, but tells me way too much about her love life???? But, She puts the cotton and foil then puts me up near a light. She said the heat looses the polish, which means less scraping! Love the post you did and can you tell me the color and brand that’s on your nails in the picture. I have always wanted to try it at home!! Thank you for posting this! Hi, Sarah! Right now it’s about 1.5 weeks but I’m still working on perfecting the application! I think I could get it to last longer! Thanks for sharing – I haven’t seen those nail polish soak-off clips before, they look amazing! 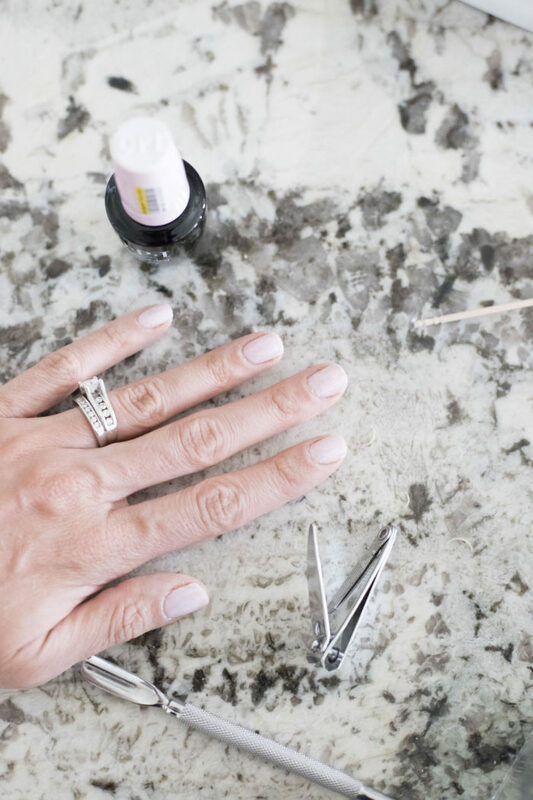 I started doing my own gel nails at home about 4 years ago for the same reasons as you – the drive to the salon, the time away from my family, having to wait at the salon, etc. etc. Now I do my nails at home after my kids are in bed and watch a show. It’s wonderful. Practice makes perfect! Many of my friends can’t believe I have a steady hand to do my opposite hand but it’s like second nature now. Just keep practicing and thin coats of polish are definitely the key! 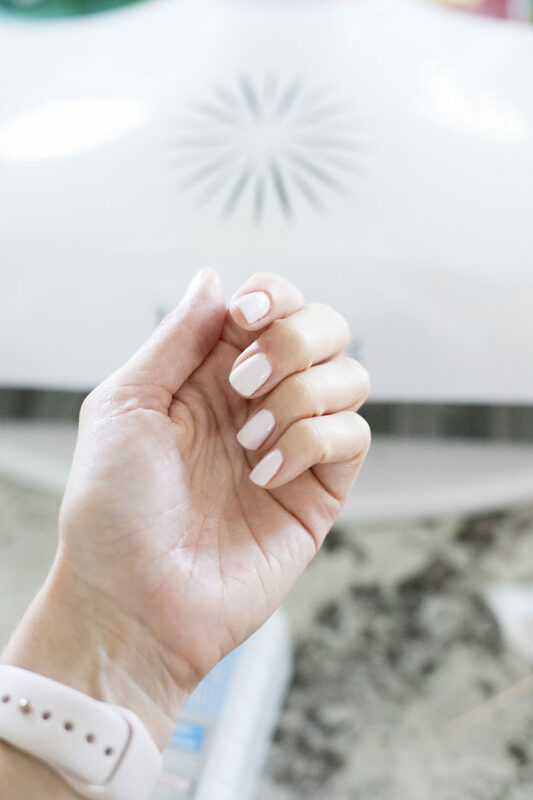 It’s an investment to buy the light and gel nail polishes but if you are spending $30-$40 at the salon, the equipment pays for itself in about 5 manicures – so worth it! Thank you so much for your amazing feedback; I really appreciate it! I’m excited to keep doing this and get better and better. I love that I can watch my shows and do this at the same time! Hey Jenica – another question I was just thinking of, do you cap the free edge? I see some tutorials That say this is a must but I have a hard time doing it. Do you recommend the no light gel polish sold at Walmart stores? I have a light but wanted to know what you thought. Also, when I have applied the thin coat of base coat it looks as if it is not perfectly smooth, as if not enough gel on the wand itself, how to determine how much is enough???? Any ideas? Rose – I have never used the no light gel polish so I can’t say! 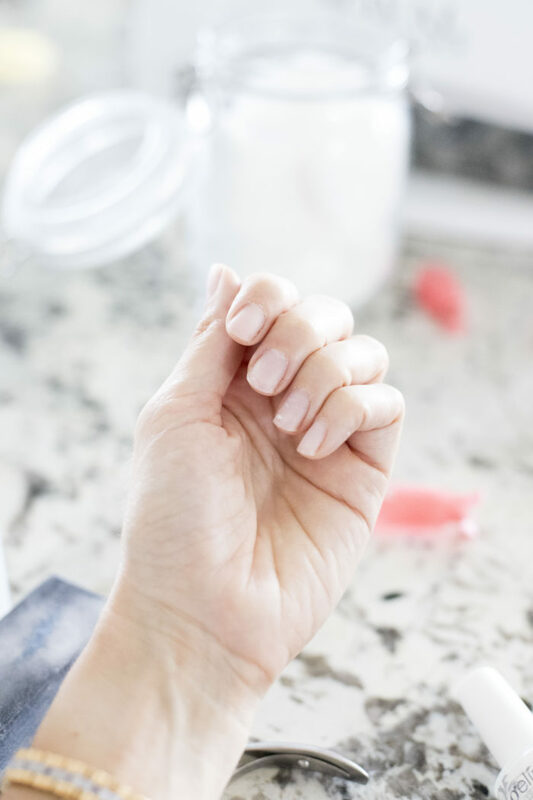 When I googled “how to do gel nail at home” your blog post popped up and I am so thankful it did! I currently have all those items in my Amazon cart. I do have a few questions. First, do you mix brands of gel polish? (like do you use a gelish polish for the base and then OPI gel color on top?) Second, have you ever tried the gel polish Elite99? I found a good deal on that brand on Amazon, but I want to make sure they are quality before I do. Lastly, do you buy all your gel polishes individually or do you buy them in bulk somewhere? Thanks so much, I can’t wait to try this! Thanks, I just read your post and did my first gel mani! I’m surprised at how well it turned out. Thanks for the instructions and tips, I got the whole gel setup from my friend with no instructions! I’m so glad you love it!! It’s so nice to be able to do it from home! Have followed your tips & directions, just did my 3rd set, they are lasting longer than salon & I don’t get bubbles (a real pet peeve of mine) I figure so far I’ve saved over $100. This is a great step by step with usefull images to get a professional loking gel nail polish look at home. You have given me the confidence to try it for myself. Especially if my nails turn out like yours. Thanks again. Hey girl, I just found your site now. It’s very helpful! Can you tell me what you used for a table? I only have our dining room table which is not suitable for this project so I was thinking of putting some kind of table cloth down that won’t allow anything to spill through. How are you? 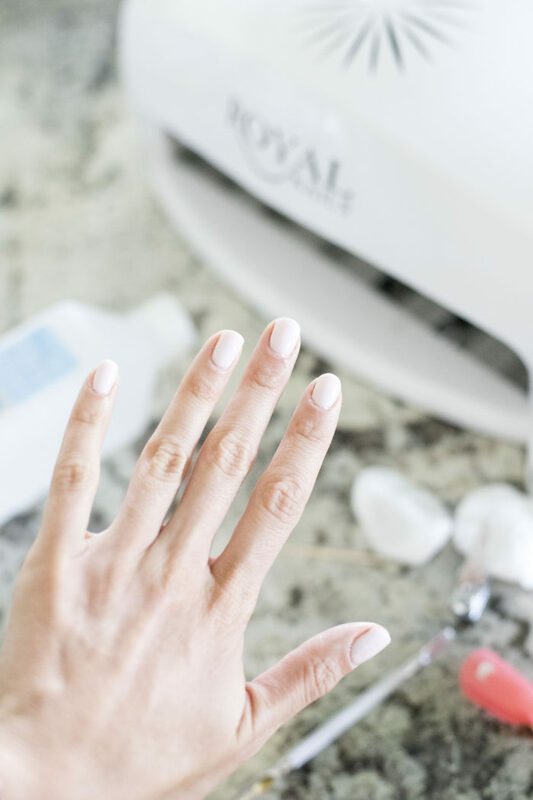 I really enjoyed your article on doing gel nails at home. I’m in the process of developing a gel nail travel kit to sell on amazon. I’d be more than happy to promote your blog on my social media sites since it’s directly related to my product(s). I would love your opinion on my gel nail travel kit, due to your experience on the best supplies to use. This is such an informative step by step guide! Sometimes going to the salon constantly just is not affordable and doing it at home could save you so much money. Thank you for sharing! Thank you so much for your kind comment! I am so happy you are finding this tutorial helpful! Thank you so much for your kind comment! I am so glad this post is helpful!